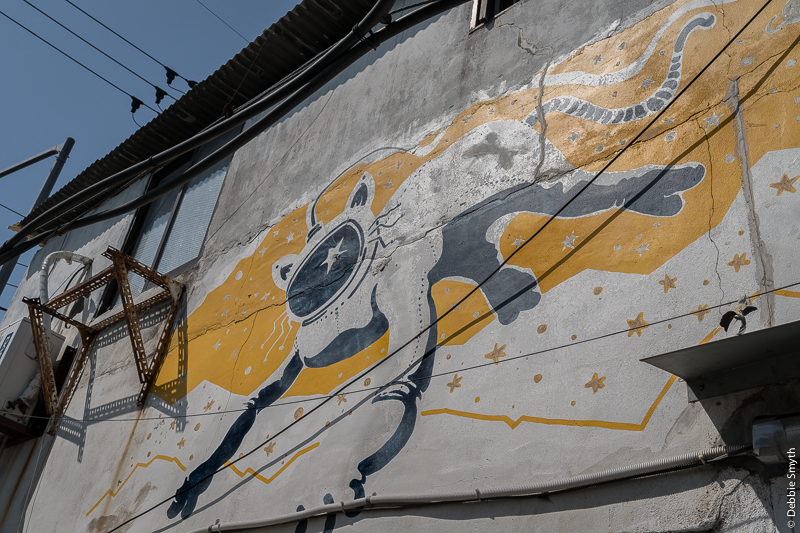 My hunt for street art in Seoul had been somewhat disappointed on my walk around the Hongdae area, close to the Hongik University. 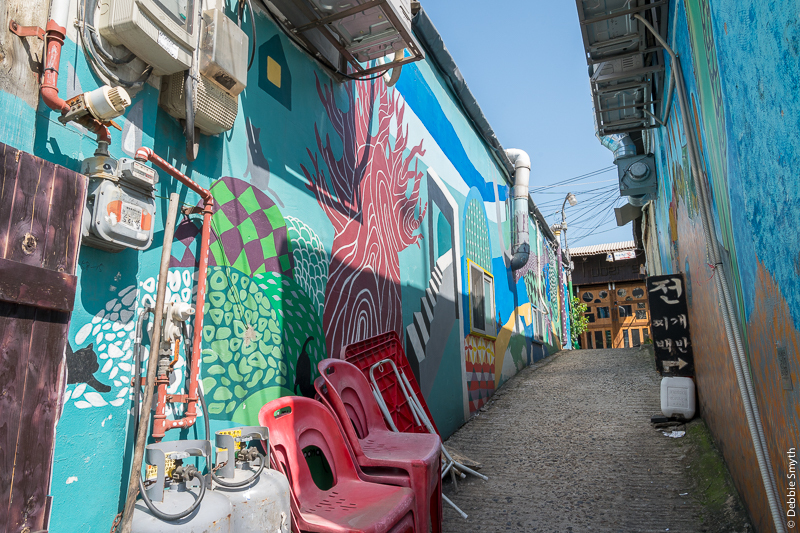 Hongdae has developed over recent years, becoming a more expensive area to live and work, with less blank wall space. 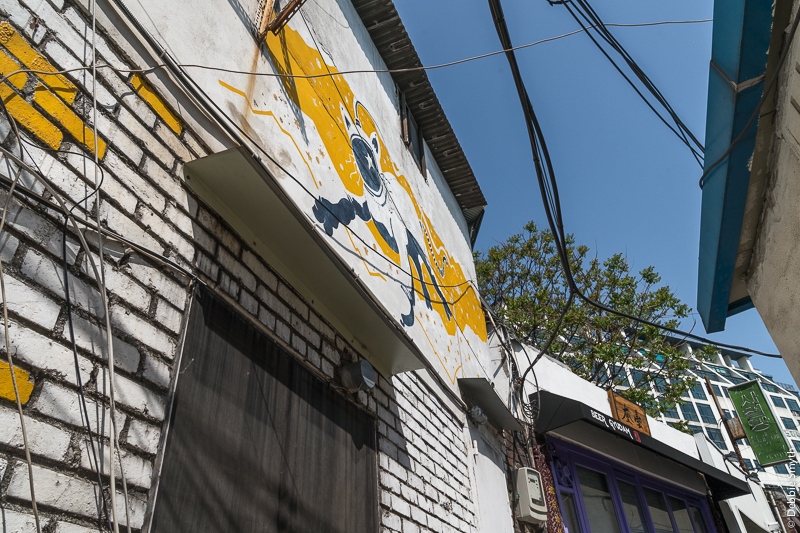 But it has many cafes and friendly people, and a couple I met over a late breakfast had suggested that I head over to Mullaedong, south of the Han River. The subway in Seoul is easy to use, so a day or two later I hopped onto line 2 for a quick journey to Mullae. This area is still busy Seoul, but the narrower streets soon draw you into an area that combines high tech and low tech with ease. The area has undergone a varied commercial history, benefitting from its proximity with water. In its early days, it was principally an area of mudflats, known as Sacheon-ri (Sand Village). When the Japanese moved into Korea, the place changed both its nature and its name: the water attracted Japanese textile companies and it became Saokjeong, Weaving Village. Following independence from Japan, there was a governmental push in the 1960s for self sufficiency in iron production, and the weaving was replaced by steel foundries and skilled metal workers. Changes in demand, plus price competition from China, have seen a reduction in the size of this industry in Korea since the 1980s, but there are still plenty of small ironworks in Mullaedong. If you visit during the week, you’ll be greeted by the clanging of metal and the roaring of machinery. These people are hard at work, and respect for both privacy and safety mean you don’t get in their way, but I stopped many times to admire the skill of these workers. 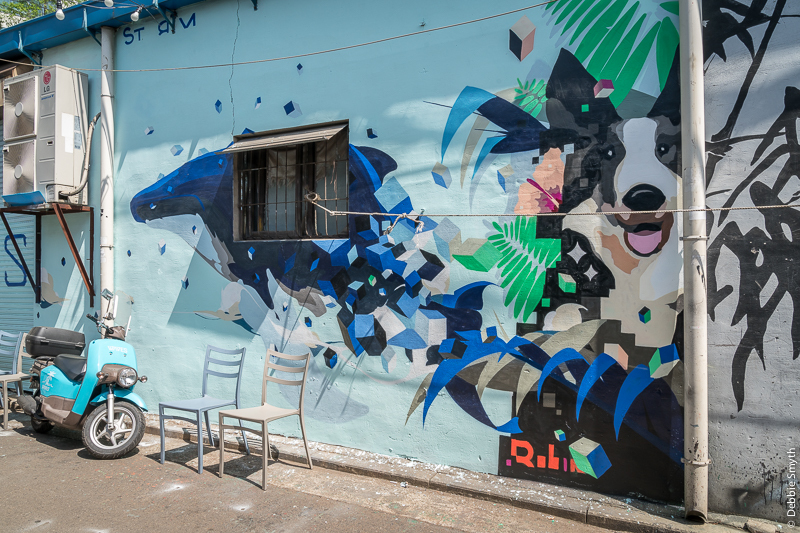 I didn’t have a detailed map to hand, and I’m no good at following directions anyway, so I meandered randomly around the streets, with an eye open for art studios and street art that I knew must be here. Much of the art reflects the industry of the area, some of it made of metal. 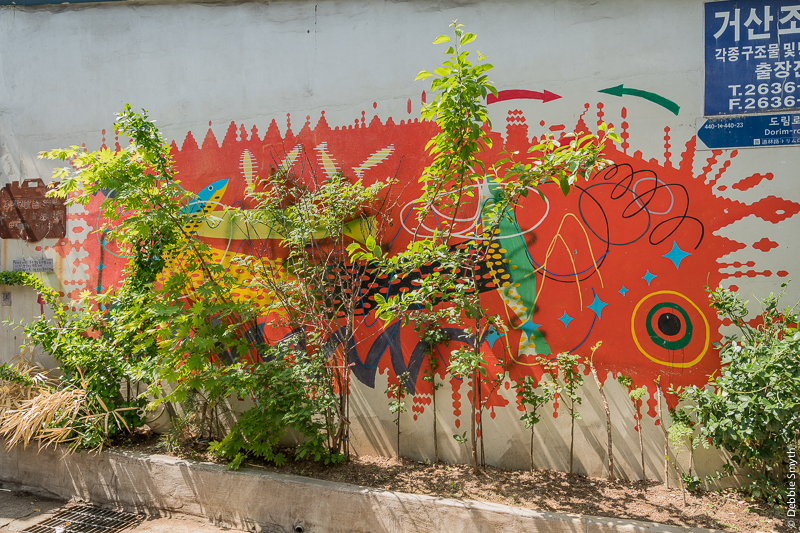 Much of the artwork simply sits happily with the ongoing metal and construction work, which has its own colourful impact on the area. 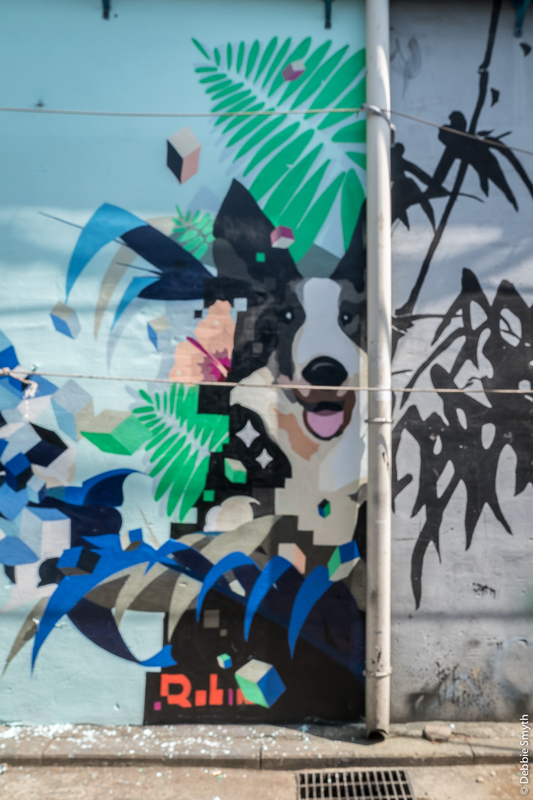 There are also many more traditional style murals, including an inquisitive long-eared jerboa by Pso Man (one of his works in Hongdae here). There was so much to see in the area that I didn’t have time to pause for refreshments, though there was a very tempting selection of coffee, beer and food haunts. As I wandered I discovered that there is actually a form of guided walk around some of the street art here. Often numbered signs jump out at you, not physically, don’t worry, to point you up an alley that you might think of exploring without this numeric help. I’ll leave you with another Pso Man mural, and also a helpful tip – there is a useful map of the area, linked to the numbered signs I mentioned earlier, close to the exit for the subway. I had looked for one when I arrived but was obviously in too much of a hurry to get walking. You do have a nose for interesting places, Debs. 🙂 🙂 Sorry I’m a bit late joining you here. I only took my phone to the Algarve and I can’t do much with it. Back last night and hopefully walking again on Monday. Many thanks to you! Welcome back Jo. I hope you had a great time. This was one of my favourite parts of Seoul. Very interesting post, even if the low tech looks a bit… fragile it seems people there are in control. Maybe we´re all just so civilised, we don´t even can handle the basic things in life. Nice to see that creativity can just run along. 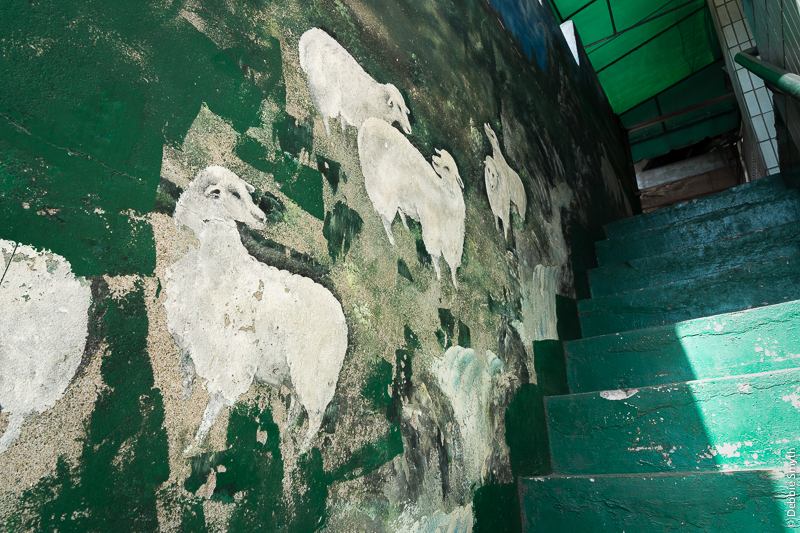 Quite a lot of murals you found in the area Debbie. Love that metal sculpture! I admire your voracious appetite for finding these places, Debs! It always appeals more than visiting the things I’ve already seen in the guidebooks! Yep! Turn those corners, find the side streets! Fascinating impressions, Debbie! The murals are spectacular. I loved the area, for all of its aspects.